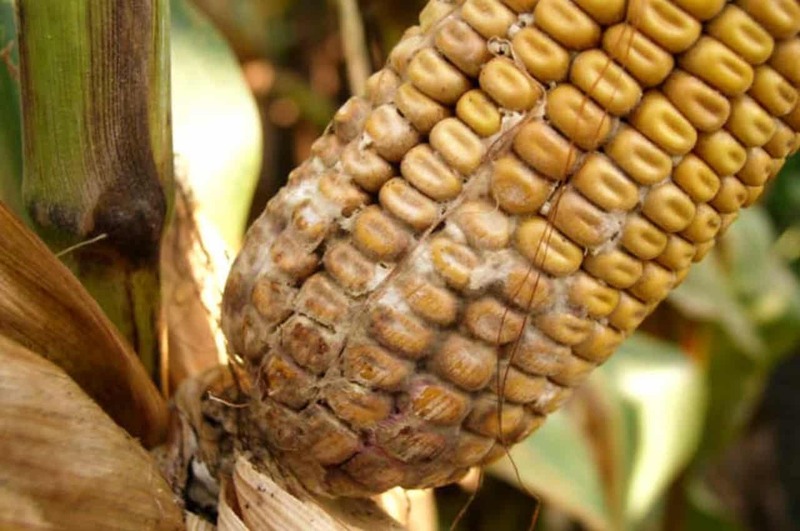 Corn ear rots can cause serious damage to farmers by reducing the quality of seed obtained from harvesting cobs and implicitly by reducing the revenue received. It’s very important for everyone working in agriculture to be able to identify these diseases of the corn ear, which are responsible for the formation of those toxic compounds that are known as mycotoxins in the grain of corn. 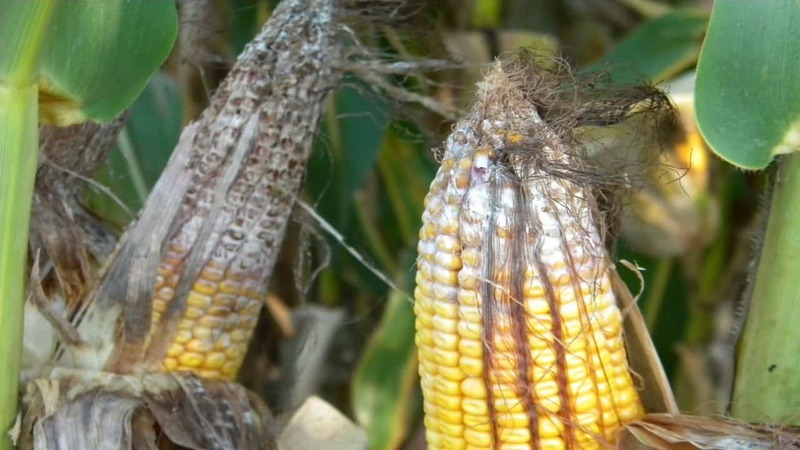 Even when farmers try their best to prevent the occurrence of corn ear rots, most corn disease that affect ear corns are very common, because they are favored mainly by weather conditions (drought, heat, heavy rain etc.) 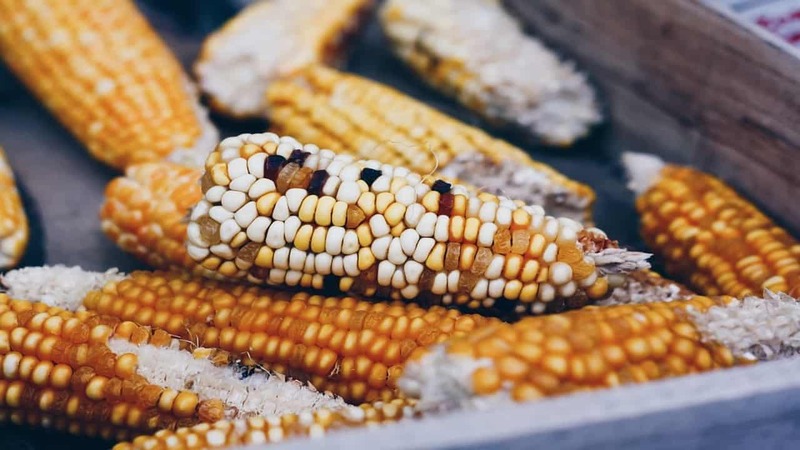 Therefore, it’s necessary to be aware which are the most common ear rots that affect corn crops, in order to ensure prevention or to do some damage control in the case of affected crops. Aspergillus is one of the most common corn ear rots. Usually, it’s caused by the fungus Aspergillus flavus, but it’s also possible to notice other Aspergillus species on corn cobs. Aspergillus produces aflatoxin, a particularly harmful toxin (it’s carcinogenic), affecting the crop quality of corn. All farmers are required to follow strictly the occurrence and/or evolution of Aspergillus, because aflatoxin it’s not allowed to be found in products for human consumption. Aspergillus survives the winter on plant debris, and the disease manifests itself by the end of pollination. High temperatures and high humidity favor the development of the fungus. Drought, nutrition deficiencies or insect attacks are other favorable causes for its development. 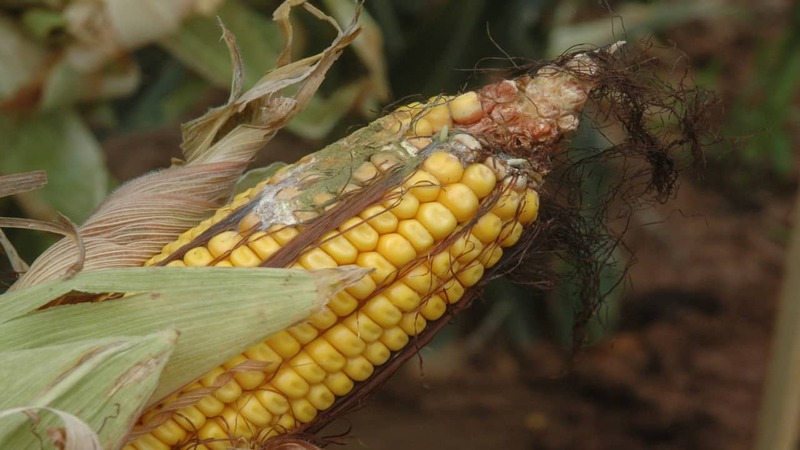 The fungus can infect the corn ear and produces aflatoxin after its physiological maturity, particularly when there are heavy rains falls during harvest season. It’s very important to know that corn seeds which seem to be healthy on the surface may contain aflatoxin. How to recognize Aspergillus? Aspergillus is manifested as an olive-green mold enveloping corn kernels. The spores of the fungus look like a powder and may spread in air when the corn is husked. Most commonly it can be seen on the top of the corn ear, but it can also infect other parts of it too, all the way to the bottom. How does Aspergillus affect corn crops? When Aspergillus attacks a corn crops, the yield is usually already reduced because of the drought stress. The fungus may reduce the weight of the infected kernels. The production of aflatoxin is variable, but it most likely occurs under drought and heat conditions. The corn must be tested in order to determine whether aflatoxin is present, as there is no method to eliminate the toxin from infected corn. 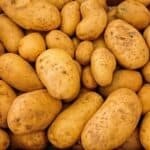 Aflatoxins are dangerous because they are not destroyed through fermentation, and will be concentrated in dry distilleries grain, which strongly affect the commercial value of the yield. Fusarium verticillioides is the main culprit of this disease. The fungus survives in vegetable debris and spreads very rapidly through spores with the help of wind. It can infect both seedlings and small beans barely formed in milk; it can develop in the stem or in the corn ear without producing obvious symptoms. 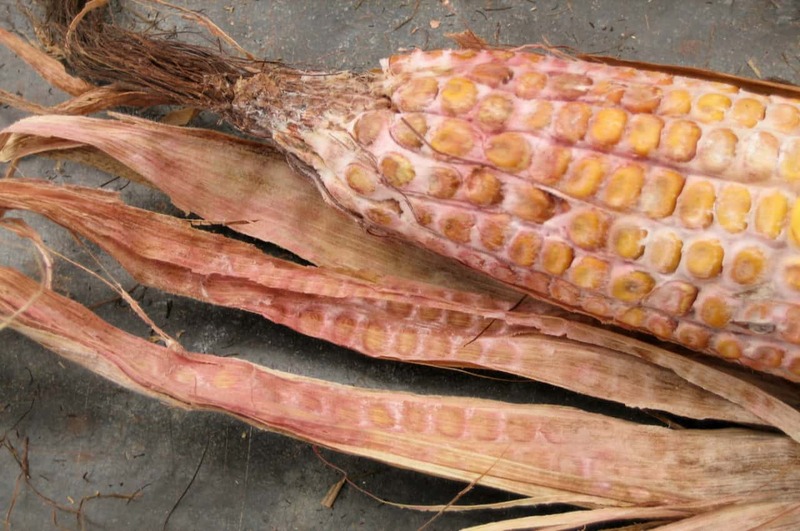 Most aggressive Fusarium infections can occur in warm areas, where insect attack or hail are present, or when there is any other form of injury to the corn ear. Although the effects on yield are limited, damage by the toxin produced by the fungus developed (fumonisins) can affect both animal and human health. 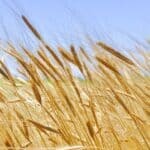 High concentrations of the mycotoxins can be found in crops where high temperatures combined with excessive humidity persist around the harvesting period. How to recognize Fusarium? Fusarium infected seeds can be found dispersing or grouped, in which case it’s possible to most likely recognize the attacks of pests (Ostrinia, Helicoverpa) between the rows of seeds. Grains attacked by Fusarium can have a purple, light brown or dark brown color. When the fungus becomes visible at the surface of the grains, they acquire a white or pink hue. In some cases one might see on the surface of infected seed white striations, caused by the pathogen development in the corn grain. 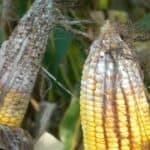 How does Fusarium affect corn crops? The grain quality of corn crops affected by Fusarium is significantly reduced, as well as the yield. In the case of severe infections, corn ears may be entirely consumed by the fungus, leaving behind only husks that stick to the kernels only by mycelia. The fumonisins (mycotoxins) produced by Fusarium verticillioides and Fusarium proliferatium are fatal for horses and pigs, but can also damage the organs of other mammals and are carcinogenic. Thus, if a corn crop was compromised by fumonisins, it’s highly unlikely to be of some use. The fungus that causes this disease is Gibberella zeae (Fusarium graminearum). It produces two mycotoxins: deoxynivalenol (DON, which is also called vomitoxin) and zearalenone. These mycotoxins cause poisoning, especially in pigs. The fungus survives over winter in plant debris or nibs and can infect soybean roots. The spores produced by the fungus will infect corn plants during silking. It grows well when the weather is cold and rainy during the early rainy silking stage. Rains that extend into autumn harvest increase the severity of the Gibberella attack. The pathogen attack is much stronger in the monoculture of corn or when wheat affected by Fusarium on the wheat ear was planted prior to the corn crop (they share the same pathogen). How to recognize Gibberella? Gibberella produces a rosy mold, which starts from the tip of the corn ear. In severe cases of attack, the husks and the silk are stuck to the grains look, making it look like “mummified” corn ears. 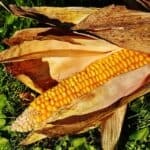 How does Gibberella affect corn crops? This fungus consumes dry matter in the grain. The test weight is lower, which reduces the grain price, but the entire yield is also reduced. Gibberella also reduces grain quality. Grains may be downgraded in quality, as the maximum limit of damaged kernels varies between 2.7% and 10%, depending on the type of corn. Storage life of corn affected by this fungus is also reduced. The kernels may be unsuitable for food products or for animal food, and even for ethanol production, if mycotoxins are produced. It’s a disease caused by Stenocarpella maydis and S. macrospora and can sometimes cause serious damage. Pycnidial formations surviving in winter crop residues are responsible for infection in the following year. They appear as black dots spread over the surface of the husk, on the corn ear or on the sides of the seeds. Drought before the silking, followed by rain, monocultures and min-till favor the Diplodia attack. Late harvest combined with rains may favor the development of the pathogen. How to recognize Diplodia? In infected corn ears, generally closest to the ear, the leaf is dying prematurely in the milk or wax beans stage. Diplodia is a very dense gray-white mold, installed between the kernels from the corn ear base and advancing to the top. It can rarely be seen in the middle of the corn ear. 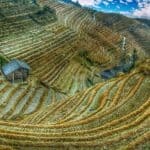 How does Diplodia affect corn crops? Because the fungus affects strongly the development of the corn ear, the kernel size is significantly lower, which affects the grain quality and the yield. If the Diplodia infection occurs early, some corn ears may even not produce any harvestable grain. The growth of the fungus is most common during the milk, dough and dent stages. Mycotoxins are not associated with Diplodia, but it may occur than animals reject infected feed. To avoid problems with common corn ear rots, it’s best to choose corn hybrids that tolerate very well the attack of these pathogens. It’s also important to ensure a balanced fertilization, to eliminate weeds and to create the proper condition for corn plants to develop. Also, it’s a good idea to opt for early seeding, to avoid the attacks of pests that favor the development of fungus.